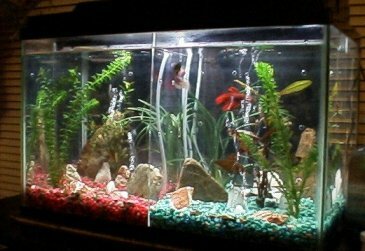 Tank Details: 55 U.S.Gal 48"x12"x20" also a 30 U.S.Gal 30"x12"x19"also a 10 U.S.Gal divided into 4 smaller homes for the bettas. . The Fish: The 55 gal. tank has koi goldfish that will be moved to the outside pond in the spring. 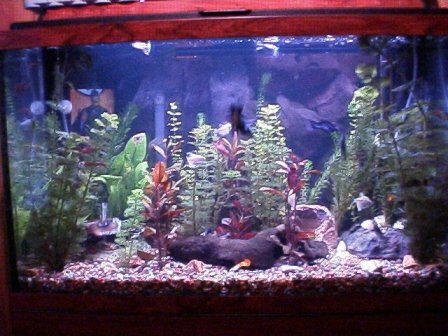 It also has a black ghoast knife and a cat fish the 30gal. tank has a smaller black ghost and a black moor all seem to live very well together. Comments: The wife and I are kind of new to all this but we are learning very fast, we are having the best time. 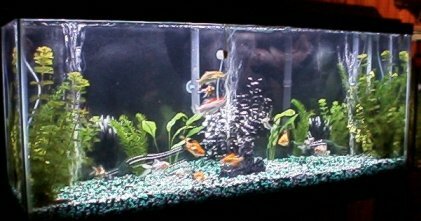 The 10 Gal tank with the bettas is the wifes pride and joy.